If I had a dollar for every time someone asked me, “but where do you get your protein?” I might just be rich and powerful enough to spread my own nutrition myth. That’s exactly what it is — the idea that we cannot survive without animal protein — a myth. Now, to those veg-curious readers out there, please don’t bolt! I am not about to unpack some conspiracy theory, I promise. Hang around and by the end of this article you’ll have a few more things to consider when making dietary decisions for you and your family. Why does everyone think meat is the only protein source worthy of any merit? Like any company with something to sell, the meat and dairy industries sought out the most nutritionally beneficial elements of their product and got the public to believe they HAD TO HAVE IT. This is no wild accusation: this is just standard marketing strategy. Throw in billions of dollars though, and you have the power to step that strategy up a few notches. Cue ‘nutritional education’ suspiciously funded by, you guessed it, meat and dairy lobbies. The long-running and unrelenting PR has done a spectacular job; top marks for wide scale disinformation. The idea is so ingrained in our collective belief system that assumptions of protein deficiency and ill-health are the first thing that springs to mind when omnivores learn that someone is a vegan.The truth of the matter is this: animal products are not the only source of protein nor are they the best source of protein, in fact, our over consumption of animal protein is doing more damage to our health than good. Is protein as important as they make out anyway? Protein is an essential nutrient and enormously important in the building and repair of muscle tissue as well as key in maintaining a host of other bodily functions. But the average omnivore consumes three to five times as much as experts now say is necessary.Major medical journals and scientific reports are now warning that excess protein has been found to promote the growth of cancer cells and can cause liver and kidney disorders, digestive problems, gout, arthritis, and calcium deficiencies leading to diseases like osteoporosis. T. Colin Campbell, a Professor of Nutritional Sciences at Cornell University, the senior science advisor to the American Institute for Cancer Research and the author of The China Study says there is “a strong correlation between dietary protein intake and cancer of the breast, prostate, pancreas and colon.”In Your Health, Your Choice, Dr. Morter writes, “The paradox of protein is that it is not only essential but also potentially health-destroying. Adequate amounts are vital to keeping your cells hale and hearty and on the job; but unrelenting consumption of excess dietary protein congests your cells and forces the pH of your life-sustaining fluids down to cell-stifling, disease-producing levels. Cells overburdened with protein become toxic.”So, our obsession with eating as much lean animal protein as possible is actually making us sick — not the other way around. Can we get all the protein we need from plants? Yes, absolutely. Protein consists of 20 different amino acids, 11 of which are synthesised by the body. The remaining nine, known as essential amino acids, must be ingested in the food we eat. Not all plant-based proteins contain all nine essential amino acids but as long as you are eating a well-balanced, whole-food diet of grains, nuts, seeds, vegetables and legumes, your bases will be well and truly covered. 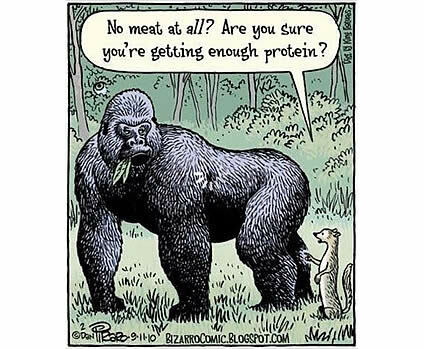 If you satisfy your protein requirements with plants you will be avoiding the large amounts of saturated fat and cholesterol that come along for the ride when you’re gobbling animal proteins. These artery-clogging substances are a main cause of heart disease, kidney failure, stroke and obesity. Instead you’ll be upping your intake of other nutrients such as fibre, vitamins, minerals, phytochemicals and healthy fats. 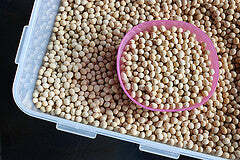 What are some plant-based protein sources? Even your humble head of broccoli is a great source of protein but here are some top-notch sources of plant-powered protein to add to your colourful, well-balanced diet. And don’t forget some of the biggest and strongest members of the animal kingdom — the gorilla, elephant, rhinoceros —are 100% plant powered. I betcha nobody asks them where they get their protein!